Al Bahar’s new branch office in Sohar. 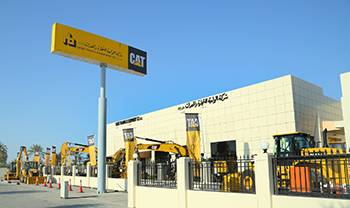 UAE-based Al Bahar, the authorised Caterpillar equipment and engine dealer in the GCC (excluding Saudi Arabia), has announced the opening of its newest branch office at Sohar in Oman through its sister concern Oasis Trading and Equipment Company. The new 10,000-sq-m branch located at University Street next to the Sohar University, will offer the complete range of Al Bahar’s services, including dedicated service centres and exclusive parts inventory. The new workshop can handle 12 machines at the same time, with the support of a team of specialised technicians. With this opening, Oasis now has four outlets across the sultanate in key locations such as Muscat, Sohar, Salalah and Nizwa. The grand opening ceremony was held in the presence of Engineer Salim Al Maqbali, the deputy manager, Royal Court/Sohar Development Office and Engineer Khalid Al Alwai, the assets manager, Sohar Port & Free Zone. On the new branch opening, Bashar Al Barghouthi of Oasis Trading, says: “Oman being a very crucial market for us, we at Oasis Trading are very pleased to have expanded our network here. For over 60 years, we have been providing machine and power solutions to the Middle Eastern region, and with each branch, we intend to reaffirm our commitment to assuring customer value. “The opening of the Sohar branch is a part of Oasis Vision to meet growing customer business needs and provide support for their new projects and operations. Additionally, we foresee a boost in the quarry market in Sohar with the development of the port area, resulting in need of more local support and machinery,” adds Al Barghouthi. Other guests of honour at the event included dignitaries like the Mayor of Sohar Municipality, director of Sohar Commercial Commerce and CEO of Sohar Port Authority. In addition to the well-known names from the industry, the ribbon-cutting ceremony saw the participation of over 85 customer representatives and many from the local and Al Bahar’s head offices.